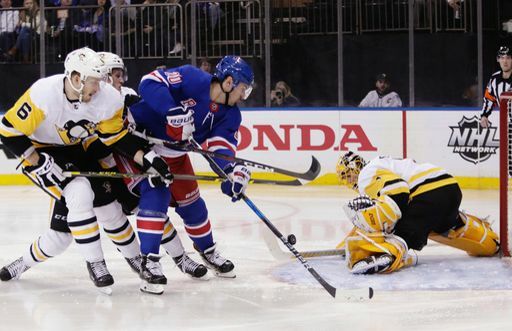 After Saturday’s surprising win over the Leafs, the Rangers are back in action tonight against another playoff team. I think we can all agree that outside of potentially the Isles, the Penguins are all of our least favorite playoff teams. Their time will come. But it isn’t this year. The Rangers are dressing weird lineups, as elite fourth line forward Brendan Smith continues to play on that fourth line. I guess it makes sense, since the Rangers are apparently shutting down Kreider and Fast. He’s looked surprisingly decent in that role too. As long as the kids get good, long looks, I’m ok with basically everything else. I’d like to see Lias Andersson get much longer looks and gain some confidence. Ditto Filip Chytil. That’s all I ask in the final seven games. Matt Murray gets the start. Crazy Prediction: Crosy doesn’t complain about anything tonight. "Game 75: No one likes the Penguins", 5 out of 5 based on 1 ratings. Too crazy a prediction. Out of the realm of even remotely possible. Yeah,I think Gilmour getting a hat trick in his first game up from Hartford was more likely to happen. Who do you guys think will win the Steven McDonald Award? Mika probably, no one else played like they wanted it this year — at least consistently. Penguins have picked up their play recently and it showed. I was not able to watch the entire game. I did catch the second period unfortunately. Man, Shatty was pretty brutal in the 2nd. But, overall it fell about quickly team-wide that period. Too bad, would have liked to see a competitive game against the flightless birds!